If “friendship is magic,” then a collection of My Little Pony-inspired nail polish is truly magical indeed! Coming to an Ulta or Sally Beauty near you in July, My Little Pony x China Glaze nail polish is ready to sweep mani lovers with a penchant for childhood nostalgia and pop culture phenomena off their feet. Even if you didn’t spend time as a kid brushing through their lustrous manes and tails, the 12 hues include something for everyone, such as Hay Girl Hay! celestial holographic glitter, Cutie Mark the Spot pistachio mint crème and I Sea Ponies, a magical silver holographic chrome. Two additional limited edition shades, Songbird Serenade and Best Ponies Ever, are available in the Songbird Serenade kit. Of course, the timing is, well, timed: My Little Pony: The Movie is due to hit theaters on October 6, 2017. But this isn’t China Glaze’s first rodeo with My Little Pony; a few seasons ago, China Glaze lead artist Casey Herman painted nail art inspired by the well-coifed ponies at the Degen show, and for Fall 2017, China Glaze and My Little Pony joined forces at the Hayley Elsaesser show to create harmonious tips. To celebrate this magical friendship, China Glaze is trotting out the talents of six nail artists—which they’ve named the “China Glaze Mane 6”—that includes Casey Herman (@caseynails), Hannah Lee (@hannahroxit), Lexi Martone (@leximartone), Britney Tokyo (@britneytokyo), Sarah Waite (@chalkboardnails) and Naomi Yasuda (@naominailsnyc) to create My Little Pony-themed nail art using the collection. Use their designs as inspiration or tap into your own My Little Pony memories (we have many!) 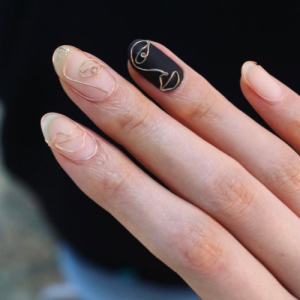 to craft playful nail art. Which one of these cutie, mark-inspired hues tickles your fancy?